The purpose of the different connectors on the board and the assigned pin numbering (red arrow points to pin 1) are shown in the image below. 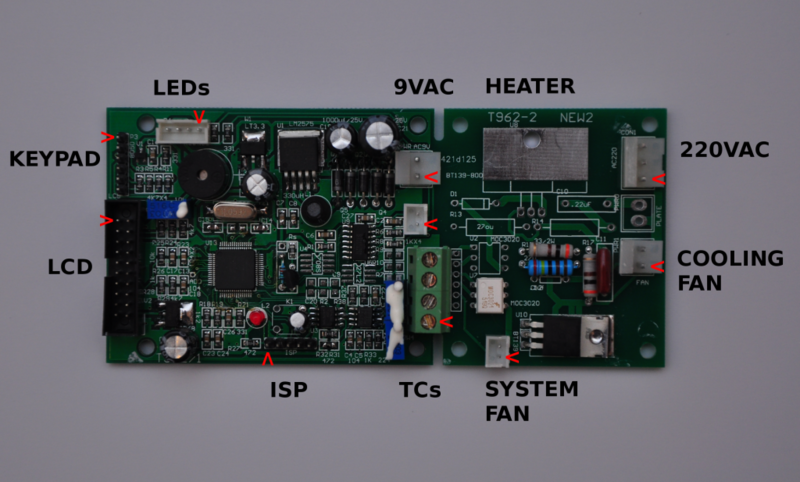 The thermocouple preamplifier is implemented using the precision dual OpAmp TLC27L2 of Texas instruments. The output of the preamp is fed to the 10-bit ADC of the NXP LPC2134 micro-controller. The screenshot below shows the schematic of the preamp in LTSpice IV. 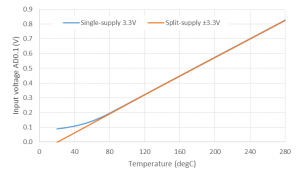 The K-type thermocouple results in a temperature dependent voltage on input 1 of the ADC as shown in the graph below. The different curves are for various positions of the potentiometer RW3. 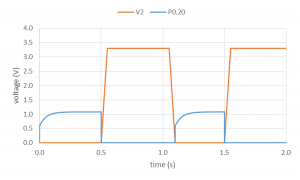 In-circuit resistance measurement of RW3 and RW4 resulted in 29.0 and 22.3 kOhm, respectively. This should correspond with about 5.8 and 4.5 turns of the potentiometers. The cold-junction temperature has a small effect on the input voltage of the ADC. Looking at the source code of the firmware developed by Unified Engineering of Sweden AB, oversampling has been implemented to obtain a higher resolution of the A/D conversion. The temperature is obtained by first calculating the sum of 256 samples. The 4 least significant bits of this sum are disposed of and the result is divided by 16. The software enables adjustment with calibration settings, by first multiplying by an ADC gain value (default set to unity) and then adding an ADC offset value (default set to zero) plus the cold-junction temperature. The cold-junction temperature is measured or assumed to be 25 degC when no sensor is available. So, an actual temperature of 200 degC may result in a voltage of 0.6 V on the input of the ADC. This results in the value 0.6 / 3.3 x 1024 = 186. The sum of 256 samples of this value would be 47616 or 0b1011101000000000. Disposing of the 4 LSBs gives 0b101110100000 or 2976. Dividing this again by 16 gives 186. Note that the cold-junction temperature should be 14 degC to obtain a value representing the actual temperature. 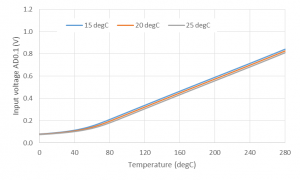 The relation between temperature and voltage is fairly linear above 60 degC. 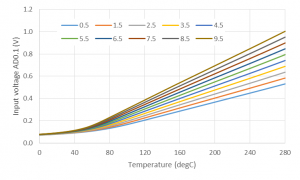 A linear correction with calibration settings will give an accurate temperature reading at high temperatures. 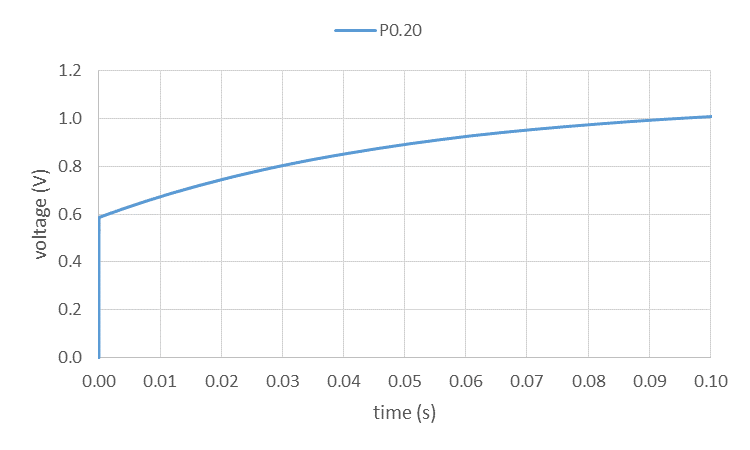 Accuracy at low temperatures may require a correction for the non-linearity of the preamp. 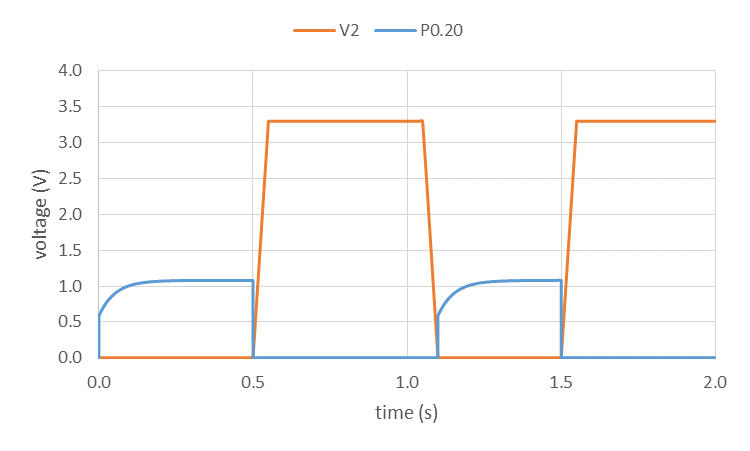 Another solution is to change from single-supply operation (3.3 Vdd and GND) of the preamp to split-supply operation (-3.3 V and +3.3 V). 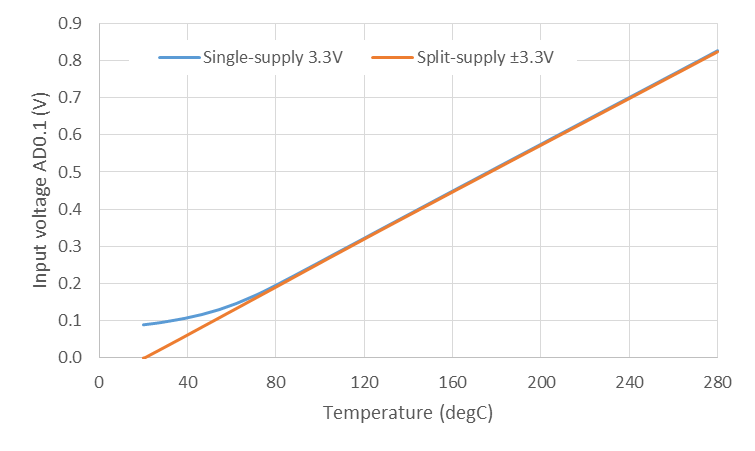 A linear fit of the simulation result with split-supply gives the following relation between voltage on input AD0.1 and temperature: VAD0.1(mV) = 3.175 mV/degC x T(degC) – 64.315 mV. Divide VAD0.1(mV) by 3300 mV, multiply by 1024 and add the cold-junction temperature of 20. The board features a PNP emitter follower to debounce the S-key of the keypad. 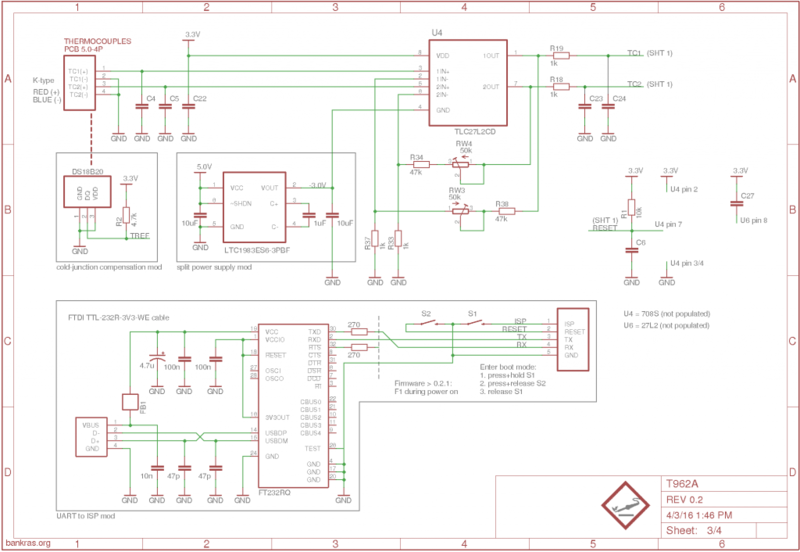 The screenshot below shows this part of the schematic in LTSpice IV. 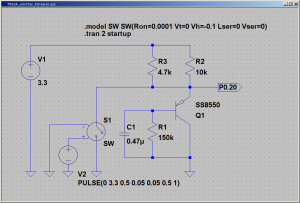 Closing the switch representing the S-key (V2 to 3.3 V) drops the voltage on P0.20 to 0 volts. The 0.47 μF capacitor (C1 in the LTSpice schematic) discharges. Upon releasing the S-key, the capacitor is slowly charged. 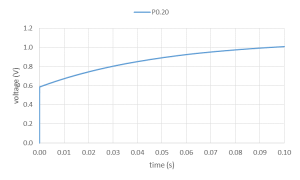 The voltage on P0.20 initially increases to 0.6 V, but it will take about 30 ms to exceed the 0.8 V level (LVTTL VIL). I need to investigate if this delay to VIL is sufficient to function as debouncer for the S-key. 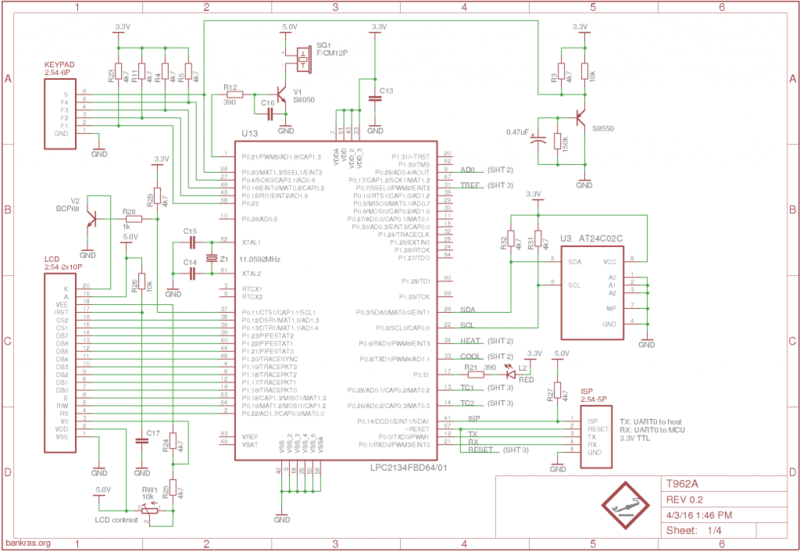 The circuit also connects to an unpopulated part of the board where the silk screen suggests a 708S (microprocessor supervisory circuit). 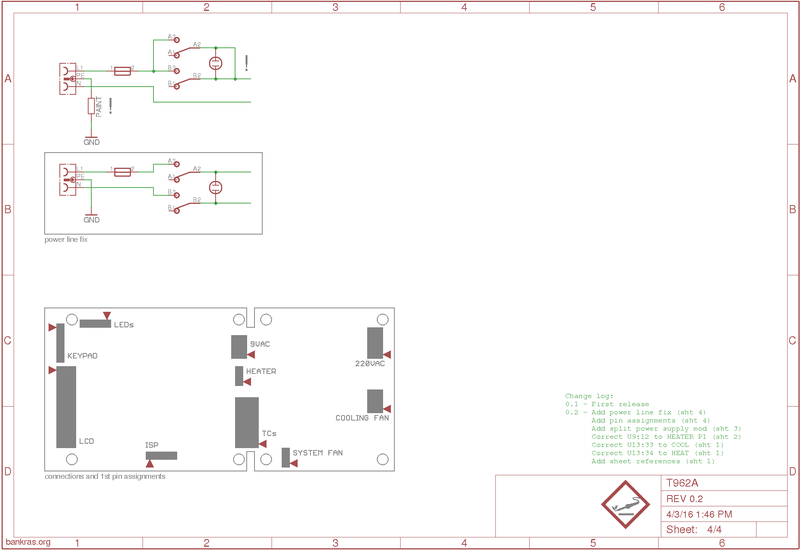 The images below show revision 0.2 of the schematic in EagleCAD 7.5.3, including the modifications to add a cold-junction sensor, replace the front panel LEDs, implement control of the system fan and add a USB port for firmware updates and process logging. 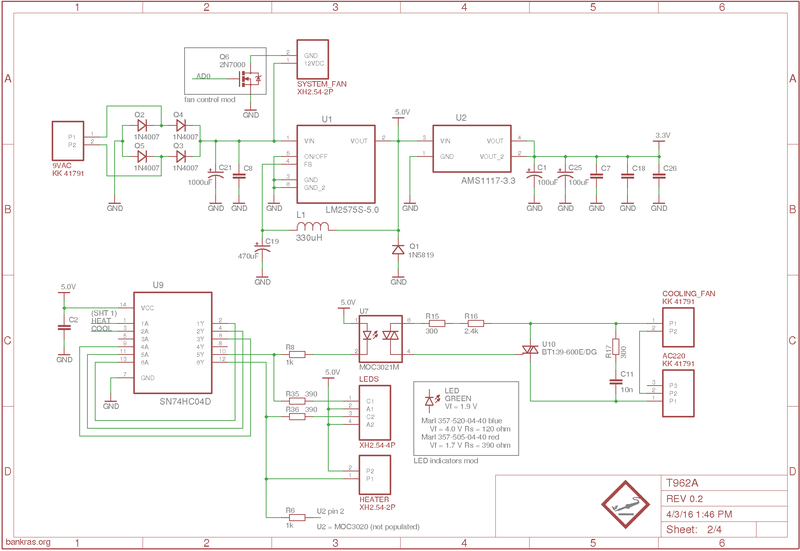 The schematic is also available in PDF on the Downloads page.